Oh my, I've got a reader crush on Deborah Smith as she has combined some unbelievable southern sassiness and fun, culinary wow, romance and suspense in her MacBrides series. 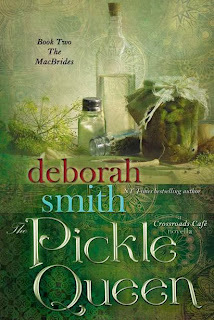 I absolutely loved the first book in the series, The Biscuit Witch and couldn't wait to read her second, The Pickle Queen. The Pickle Queen's heroine is Gabby MacBride, the eldest MacBride sister and self-professed pickle queen, whose hot LA restaurant is closing as her ex partner played dirty. And this is all embarrassing headline news on all the entertainment channels as her ex partner is a Hollywood star. But someone comes to her rescue at the last moment in court - and Gabby has an idea who might have been her errant Southern Prince Charming. Though I don't think she sees Jay Wakefield on a white horse, probably more like a mule. In A Biscuit Witch, I was convinced that Jay Wakefield might have some redeeming qualities and had a sense that there was some hidden history with Gabby - and all is explained in The Pickle Queen. Smith mixes into her culinary goddesses' fare a good deal of magic - and that might explain the soul-mate connection between Jay and Gabby - but it also could be fate. I love the fact that psychic powers are behind some of this feel-good home-cooking and if you're craving some BBQ, cornbread or biscuits, and pickles - don't blame me! There are wild and fun plot twists, including pickle eating contests, a spam and pineapple dinner that may help save a soul, cliff side fights, and so much more. This book is impossible to put down. I admit it, I'm totally hooked on this series and am now jonesing for book three, The Kitchen Charmer, which will tell the story of Tal and Gabby's armed services brother Gus (the kitchen charmer) and wool spinner Lucy. So, if you're like me and you love stories set in the south, romances that have a strong culinary bent, and a little mysticism mixed in with some page-turning suspense - DO add Deborah Smith's The MacBrides series to your TBR shelf. It's a fabulous must-read. Pickles are mentioned in the Bible. Cleopatra ate them as a beauty regimen. Shakespeare put them in his plays. Mason designed jars for bottling them. So did Ball. Did Mason and Ball fight over the King of the Pickle Jars title? I don’t know. I did know this much: I used pickles to keep fear, pride, and my love of Jay Wakefield behind a door I would not risk opening again. Even now. Wakefields take what they want. MacBrides never surrender. For nearly a hundred years, a battle of wills between these two deeply-rooted Appalachian families has ended in defeat and heartache—most often, for MacBrides. Now the MacBride name is barely more than a legend, and it’s up to Gabby MacBride to deal with the pain of her childhood memories and also the challenge of a MacBride legacy she’s only beginning to understand.